Lose yourself in your music with the help of Philips’ In-ear Headphones with Mic. The modern looking black Headphones provide a superb fit and deliver vibrant sound and deep bass. Key Features Fitted with compact efficient speakers, the Headphones deliver powerful sound and deep bass so you enjoy your music in crystal clarity. The Headphones seal out noise thanks to an oval tube insert. Switch between calls and music easily thanks to an inline mic. The Headphones have textured strain relief for great durability and a secure grip. Get the perfect fit by trying each of the 3 silicone cup sizes that come with the Headphones. The Philips SHE3905 Headphones was added to the Head Phones category in June 2016. 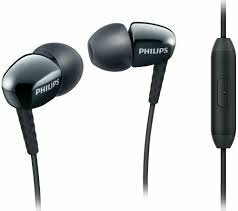 The lowest price GetPrice has found for the Philips SHE3905 Headphones in Australia is $15.57 from Amazon AU.